Has your Hitachi DVD camcorder created chaos in your life? Our friendly team is happy to help recover your video footage and movies from this mini DVD Camera. Disk Access Error, Disk Error, Disc Error, Format Error. We recover from many errors from the Hitachi DVD cameras. Some typical examples with model numbers are listed below. Disc error has occurred, Format? Repair data Yes/No? A common problem we hear when trying to finalise DVD discs on Hitachi DVD video camera is that error messages advising of a disc error and requesting format. The camera then asks if you wish to repair the data. The camera will attempt to repair the data and fail leaving the disk un-viewable. However we can recover the video footage so call or email us for a quote. The camera says found error in image file, repair data now. When you press yes it says "Error occurred. Please replace disc." or use ac adapter/charger, turn off power. It won't let you go to Disc Navigation to finalize it. While recording video on DVD-R media the battery power may have failed and camera shut off. When turned on the message shown on the lcd is Found error in image file, Error Occurred, error 0901. 1. Some DVD discs may not work due to their construction. Possibly a disc has a very thin writing surface, one so thin that the DVD Camcorder laser cannot properly write information. 3. 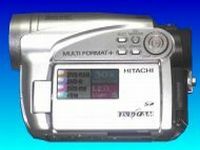 While some DVD-R discs can be written and finalized from Hitachi camcorders, they may not play back on all DVD players due to different writing surface depths. The only discs that Hitachi can verify as suitable for the Hitachi DVD Camcorders, for functionality and longevity and playback, are the Maxell brand discs. We have specialist knowledge to Finalise DVD video eg. 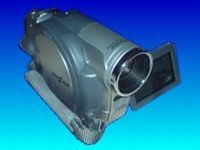 DVD Camera / Handycam / Videocam / Camcorder with problems of corrupt DVD or trouble playing mini-DVDs that occur particularly during the disk finalising process. The Camera displays disc access error message when DVD disks are not closed or non-finalised / unfinalised disc and won't play. Unlike other recovery companies we can transfer your video to be playable on stand-alone DVD players. Also repair Corruption CRC Cyclic Redundancy Check errors. Trouble occurs with Corrupt DVD disk that won't play in either stand-alone video players or the video camera, or problem transferring DVD video files to pc or mac computer. We have the equipment to bring your lost files back. We recover video from dvd discs that have not finialized properly as well as unreadable, unplayable or corrupt dvd disks. Lost video clips, movies due to the Disk Error, Disc Error or Format Error message when you turned on the camera, or the mini DVD disc finalization was accidentally interrupted. Also format error, disc error unreadable disk. After viewing the video on this disc using the camera and then try to finalize the disc you may receive the following error: "Found error in image file. Repair data now? Yes No. Choosing Yes it says it's repairing and then it says: "Error occurred. Please replace disc." It won't let you go to Disc Navigation to finalize it. DVD Video Camera Recording Problem / Trouble including dropping the camera! The problems with these mini DVD discs typically occur with the failure during the disc finalising process and results in unplayable video. The typical 'Disc Error" messages are the first sign of trouble. The mini DVD disk does not finalise properly.We have the expertise to recover your video to a playable state. Unlike other recovery companies we can return your video to be playable on stand-alone DVD players. Another problem occurs after dropping the camera or when you have opened the DVD door part way through recording and removed the disk. Often you receive a Disk Format Error message and can do nothing more with the disc. 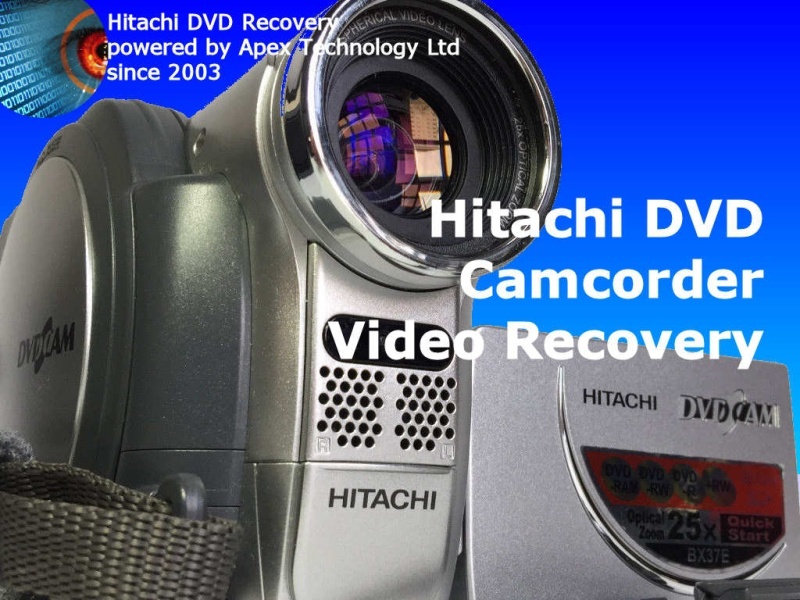 Hitachi dvd camcorder recovery problems that we recover data from are listed below. 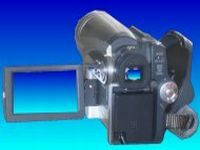 Hitachi dvd Found Error in Image File, Hitachi dvd recovery, Hitachi dvd format error, finalize dvd Hitachi, Hitachi handycam error, Hitachi Camcorder error. Hitachi dvd Found Error in Image File recovery, Hitachi DVD mini-dvd video recovery Hitachi handycam camcorder error finalize finalise dvd mini-dvd.